Care for a few cocktales? Hitting a bar is often just a byproduct of engaging in another activity, whether it's picking up girls, watching the game with the guys, or watching the guys with game pick-up your girls. For a project where hitting the bar is the whole point, Every Bar in Seattle. Predominately penned (with a little help from his girl Francesa) by a guy already intermittently blogging about suds as The Beer Retard, EBIS' a chronicle of his mission to visit and evaluate every non-resto drinkery within the city limits, mirroring a similar effort by the dudes from the now-defunct 570 Bars, also the name of one of Lil' Wayne's shorter freestyles. Posts start with the impetus for each bar visit ("Dude, I stole a car. Let's go hit some places for EBIS! "), and feature the time of day, a summary of available liquids, frank insights into other patrons (more hoodies = more hipsters), and occasionally random descriptions of the drink space, including one where the lighting "reminded me of David Lynch's Twin Peaks" -- though really, how can a bar capture both dating and breaking-up with Isabella Rossellini before she looked like a dude? So far EBIS's only chronicled 12 spots, but early highlights include downing $5 blasts of Viking Blood mead at the Zoo which, as their posters make clear, is (Johnny) Cash only; an uneven trip to South Park's Marco Polo that was only redeemed because it "has a f***ing NASCAR car"; and a group outing to the instantly likable White Horse Trading Co. where the only downside is an alarmingly open bathroom where "you wouldn't want to drop a deuce" but it's ok, 'cause Nuke Laloosh would want everyone to see his heat, anyway. 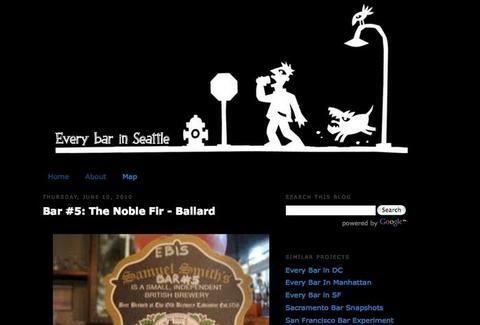 EBIS is decently faithful to its bar-only policy, but has already strayed into resto territory with a trip to the SODO collection of railroad cars that make up Orient Express, and one to the Nickerson Street Saloon, but that was only to meet a buddy in the midst of a 12-mile beer hike, the byproduct of which will be yet another activity: a 12-mile cab ride home.